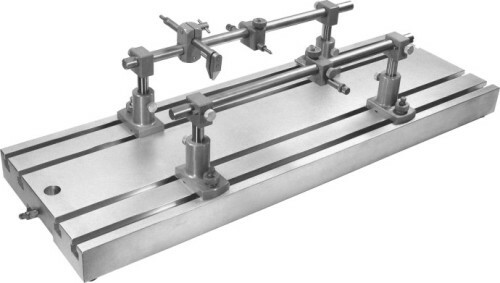 Model 1780 Large Animal Spinal Unit is designed for high inertia and maximum rigidity without sacrificing the flexibility access required to do intracellular placements rapidly and accurately. The base of the unit is Model 1712 Instrument Mounting Plate. The plate is precision machined aluminum with four full length tee slots for mounting of accessories. Rubber feet are provided on the corners to help dampen vibration. Recesses are provided at the ends for ease of handling. Attached to the plate are four base mounts with adjustable vertical posts. The base mounts are designed to fit in the tee slots without the need of sliding them on from the ends. They have quick turn tee bolts with finger locking nuts for fast, rigid clamping. The vertical posts with lock keys have ¾” shafts and 2¼” of vertical adjustment. Mounted through the upper terminals of the vertical posts are two ¾” diameter x 20″ long keyed A/P bars. This keying ensures positive locking of all accessories. Mounted to the bars are adjustable hip spikes and straight vertebrae clamps. Combines maximum rigidity with optimum flexibility. Permits accurate and reliable stereotaxic placement. Modularity allows the use of a wide range of accessories. Simple, fast and positive clamping and locking.